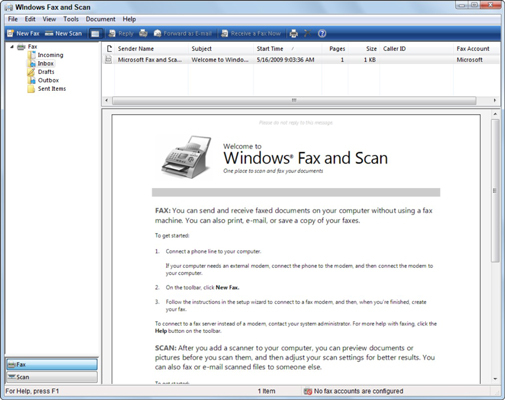 The Windows Fax and Scan utility enables you to send or receive faxes in Windows 7. You can use Windows Fax and Scan to send text entered into a fax form, documents created in other applications, and even pictures or documents scanned with a scanner attached to your network. With the Windows Fax and Scan utility, there’s no need for a standalone fax machine. To be able to send and receive faxes with Windows Fax and Scan, your computer must either be connected to a fax server that’s part of your computer network or have a phone line connected to a fax modem installed on your computer. Windows 7 opens a Windows Fax and Scan window. Before you can send and receive a fax with the Windows Fax and Scan utility, you must set up a fax account for yourself. Those steps are not covered here. Click the Fax button at the bottom of the Navigation pane. You click these buttons to switch between the fax and scanning features. 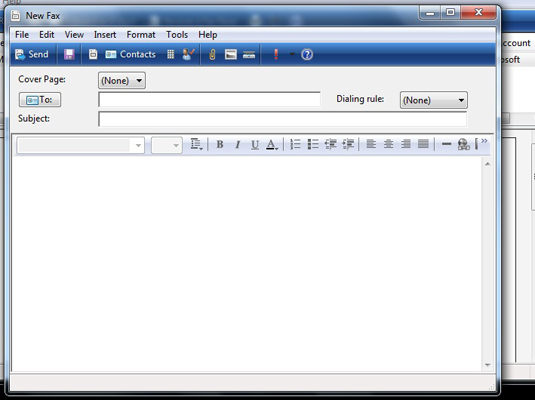 Click the New Fax button on the toolbar to open the New Fax dialog box. Select a cover page, select the contact to whom to deliver the fax, and input the text of the fax message. If you’ve already typed the text in another document, you can cut and paste the text using the Windows Clipboard. You can attach a text document to the fax message with the Attach button on the New Fax toolbar, insert a picture in the body of the fax with the Insert Picture button, and insert a scanned item with the Insert From Scanner button. When you’re finished, click the Send button in the New Fax dialog box. To receive a fax you’re expecting in the open Windows Fax and Scan window, click the Receive a Fax Now button on the window’s toolbar.